I'd been to the Chimes Wine Bar (also on Churton Street) previously as this used to be one of the more reliable cider places in London. When visiting, I'd often noticed this pub further up the street, but never set foot in it. Yesterday afternoon I finally made it in to what is a very cosy backstreet local with what seems like a fairly loyal clientele. Whilst it doesn't have the beer range of the nearby Cask, it is a much nicer drinking environment with lots of nautical memorabilia. A couple of TVs were showing football and horse racing. Ales were Greene King IPA, Sharps Doom Bar & Wadworth 6X. To my surprise, they also had Old Rosie cider - maybe because the Chimes is now no more and the locals needed somewhere else to get their cider fix. Worth popping into. The Constitution makes an appearance in the 2015 GBG so with the year running out I took the opportunity to tick it as I don't think it appears in the 2016 edition. 1pm on a Saturday when I arrive at this old fashioned locals pub that once inside you realise it’s very much a blokes drinking pub with all the clientele being male. The friendly landlord is chatting to a group at the bar who were watching both the football and horse racing that were on the televisions. 4 ales and 1 cider on the cask hand pumps. Greene King IPA, Spitfire, Sambrook's Wandle and Sharps Doombar. My pint of Wandle was very good, sometimes Wandle isn’t the best pint and from my experience is pone of those ales that suffers more than others if kept poorly. I took a seat by the front door and watched a bit of the football and listened to the locals chatting. I only stayed for a pint but it was enough time for me to appreciate this pub. 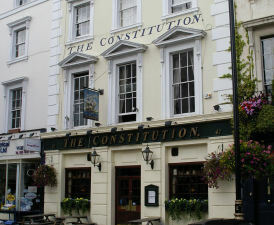 My favourite pub in Pimlico (with The Morpeth Arms being a close second), The Constitution is a welcoming, traditional one room pub with good beers, friendly and down to earth staff and a mixed and interesting clientele. The kind of place where, once you have entered, you don't want to move on from there. One of the better Pimlico pubs. You can tell they are actually making an effort. We use this pub for the footie or rugby,full of characters and the odd lost tourist,well kept bar ,friendly ish landlord,better than most around here!